On Thursday 4th October we will be having a special lunch theme "Superheroes". If your child currently has school meals this will be at no extra charge so you don't need to inform us that your child is having the meal. If your child is currently on packed lunches but would like to join in on the fun, please make a payment of £2 either on-line or via the school office before Friday 28th September. Year 5 and 6 children also had workshops on this theme today. As you will be aware, 2 of our extremely enthusiastic Year 6 pupils, Zarah I and Amirah H, are organising a Mystery Book Sale to coincide with World Book Day on Friday 2nd March 2018. All you have to do is donate any unwated books. The girls, along with some other helpers will be wrapping the books up and adding some clues to entice you to buy them for 50p. Then when you get home, unwrap your selection and see if the clues were accurate and the book is to your liking. Any donations of books will be gratefully received by Friday 23rd February to 6HM. Year 5 have been busy this week making cards to send to our friends at Barnes Court Care Home for Send a Friends a Card Day. We received cards that the residents had made us this week. The residents were pleased to receive their cards from some of our year 5 children. Abbie from Oasis Aquila Housing visited us recently to pick up the money we raise before Christmas. The £444 will be put to good use to support some of the homeless people in our community. Abbie told us they had raised over £16,000 in the campaign overall and that their new crisis centre in Sunderland, Basis, is now open. We hope to be able to work with them again in the future. The Year 5 Ettrick Team have made it to the finals of the Newcastle Eagles Hoops 4 Health Competition, to be played at Sports Central, Northumbria University on Friday 2nd February. After steadily improving throughout the tournament, they finished 3rd in their group to make it through to the qualifying round. They beat Seaburn Dene to have an all Barnes tie against Dalton to decide who went through to the big finals night. Dalton had just overcome their Bowes rivals in the knock out stages- a great achievement for both teams. Ettrick won 4-0 with 2 amazing baskets scored by the inspirational Joseph C-M. Now their attention turns to the big night at the Eagles court and all the excitement that brings and follows on from last year's Ettrick team qualifying for the finals night too! It has been a busy few weeks for the year 6 choir. After lots of practices, we were ready to perform at the Sunderland Ice Gala-until it got called for being too cold. However, the next week, we turned up at Debenhams and drew in a big crowd at their Christmas Event. the children sang brilliantly- helped by the sandwiches and chips we received on our arrival! The next day, a select group from the choir,visited Sunderland Royal Hospital and entertained the volunteers group at their Christmas Lunch. This was good fun with lots of people joining in the singing. We were treated to some nice cakes too! On Thursday 14th December, the whole choir made the short journey to the Barnes Court Care Home to entertain the residents. The children sang beautifully and lifted the spirits of the residents and the carers! This was quickly followed by a slot at the Thornhill Christmas Carol Concert. Another sub group of children who were available represented our school really well and our song choices of Oasis and Slade were well received! Our Christmas Fair takes place on Friday 15th December from 2pm. Please come along and support our event - our pupils have worked extremely hard on their stalls and are all very excited to see everyone! Tickets will also be available to buy for our raffle - we have some excellent prizes available! Winter has well and truly arrived at Barnes Junior School today! Whilst all the children were nice and warm in their classrooms, we took the opportunity to take this fantastic seasonal photograph. We would like to offer our thanks to all pupils and their families for supporting our Children in Need charity day - we have raised a massive £457.97! Thank you for supporting this worthy cause. Friends of Barnes hosted our annual Halloween Disco and a total profit of £415.43 was raised. Thank you to all who helped out. A great time was had by all. In support of our Crowdfunder project, we are hosting a non uniform day for all pupils on Friday 20th October for a small donation. In addition, we would welcome donations of cakes which children will sell throughout the day. We thank you for your support. A grand total of £432.17 was raised! From Tuesday 10th October there will be building works taking place at the Wycliffe Road side of the school building - we apologise in advance for any inconvenience this may cause. Once the works are complete, we will have a whole new area for staff and visitor parking which will help alleviate traffic congestion within the local area. Please bear with us during this time. On Friday 14th July, pupils were invited to wear their favourite football shirt to school in memory of Bradley Lowery who very sadly lost his battle with Neuroblastoma aged just 6. Pupils raised a total of £375! On 5th July we received the exciting news that our recent grant application to Kellogg's has been approved! We have been awarded £1000 which will be utilised to improve our Breakfast Club provision which will benefit all pupils who attend. We are happy to announce that from September we will be offering After School Club provision every Monday afternoon 3.25-5.30pm. Session prices will remain the same as this year - £3 per session for Breakfast Club and £6 per session for After School Club. In addition to these services, we will also be continuing with our After School Activities programme which will run Monday - Thursday 3.30-4.30pm. The activities timetable will be shared during the first week back to school in September. Friends of Barnes are hosting Barnes Junior School Summer Fair this Saturday (17th June) - 1.00 -3.30pm. There will be face painting, arts & crafts, bric-a-brac stalls, chocolate tombola, guess the name of the bear and much much more! We look forward to a fun-filled day and hope to see you all there! UPDATE - a grand total of £395.97 was raised at the fair - thank you to everyone involved. Class 4RC are Promethean Winners! We wish to congratulate Miss Crawford and all of her pupils on their massive success in winning a Promethean Activpanel for their classroom! 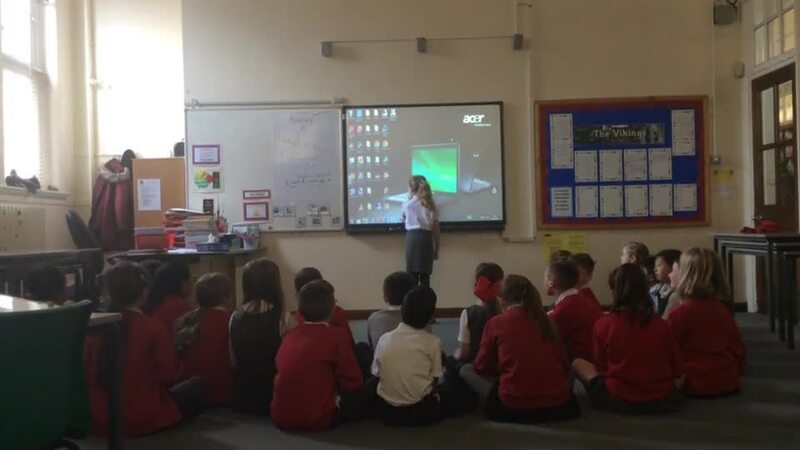 Pupils of class 4RC recently put their acting skills to the test, pulling together an entertaining video highlighting their need for upgraded IT equipment within their classroom. Over 250 entries were submitted by schools around the country, with thousands of children hoping their class would be 1 of just 30 lucky winners to receive a Promethean Activpanel. We are extremely proud of all pupils of 4RC for being chosen as a winning entry by the judges. WELL DONE MISS CRAWFORD AND ALL OF CLASS 4RC!!!!!!!! A total of £274.60 was raised in aid of St John's Ambulance by pupils participating in the recent Barnes Marathon @ Barnes Park. Well done to everyone! The votes have been counted and the results are in!!! We would like to welcome Mr Steve Jones as our new Parent Governor. The count took place on Monday 3rd April with Mr Ward acting as the Returning Officer, ably assisted by Miss Brenkley, School Business Manager. Mr Jones was present during the count and at one point both Mr Jones and Mr Madgwick were neck and neck! The final result was in just after 2.30pm with Mr Jones winning by a majority vote of 2:1. Mr Jones will attend his first Governing Body meeting on Monday 24th April and we look forward to working with him over the next 4 years. Thank you to everyone who took the time to complete our latest Parent/Carer Survey - we had a fantastic response from our Year 3 & 4 parents/carers so a special thank you is extended to everyone in lower school. In an effort to further improve upon the service we provide, we will be sharing the results with all staff at a year group level. A total of £528 was raised via our non uniform day and the sale of red noses! Thank you to who all who donated. Staff and pupils have put a great deal of effort into their 2017 World Book Day costumes and everyone looks fantastic! from the Roald Dahl classic 'The Twits'. Excitement is gathering amongst our Y5 pupils as the countdown to their annual Derwent Hill trip begins! 58 pupils and 5 members of staff are looking forward to spending 5 days away later this month, experiencing the thrill of the outdoors in the beautiful Keswick countryside. Photographs and blogs to follow so watch this space! We are proud to announce that Barnes Junior School has been awarded the 'International School Award 2016-19' by the British Council for Outstanding Development of the International Dimension in the Curriculum. Our certificate is proudly on display in the main reception area!